Art is a channel of self-expression which can prove to be extremely useful for people suffering from addiction, especially for those who struggle to communicate in other ways in group therapy or private therapy sessions. Art can help bring about feelings of self-confidence and worth while simultaneously providing patients with ways to understand and cope with their addiction. Art group is a great way for a person to explore aspects of their life that they might not be able to explain in a conventional way. What’s more, when done in a group setting, art therapy can also help people going through addiction treatment to draw closer and better understand each other’s experiences. Who is Art Group for? Art is for everyone and it is an excellent way of promoting self-esteem, but it may be of particular use for people who feel distanced from their feelings or who find it too upsetting to talk about painful experiences. Our therapists recommend certain patients who they think may benefit from this therapy and who have continued their treatment in the Extended Care Unit, and their artwork will be discussed in individual therapy sessions. Art work, like many complementary therapies is scientifically known to reduce levels of stress and anxiety by decreasing the levels of cortisol in the body. Creating something visual is useful for patients to express and process abstract struggles and emotions. Art work involves accessing the ‘creative’ right side of the brain, expressing fears and anxieties onto a blank canvas and then analysing it through a therapy session with a qualified addiction therapist. Art group can achieve different effects for different people. It can be used for counselling, healing, psychotherapy, rehabilitation. Broadly though, it can be used as a way to understand one’s inner-self on a deeper level. Local artist, Catriona Taylor, coordinates artwork sessions in our dedicated studio. 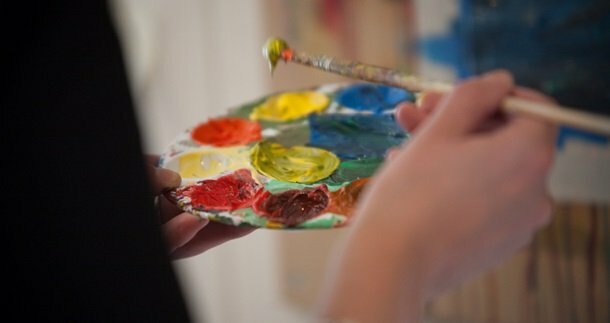 Our studio space is situated away from the main clinic and is surrounded by beautiful, open countryside, providing patients with a serene and natural environment in which to explore their creativity. Catriona uses an abstract painting style which leaves space for individual expression and does not require any previous experience. She shows patients how to use different materials including oil paints, watercolours, acrylic paint, chalk pastels, crayons and ink. “People are constantly amazed by what they achieve in the art group, particularly as they have usually told me at the beginning: “I’m no good at art”. It is so uplifting to see just how amazing and creative the work that patients produce is.” – Catriona Taylor, Castle Craig’s art group coordinator. For more works from our art groups, check the Art Group’s Facebook page.